Uri Rosenrauch: ¿ De que estas hablando, lady? Her: Remember the movie yesterday? Me: What movie? We saw a movie? Her: Yes. You don't remember? Yesterday! Me: I have no idea what you're talking about. Did I even see you yesterday? Her: How could you not remember? Me: I was pretty sure I didn't see you yesterday, but after all this movie talk I don't know anymore. Her: I watched it with you on your sofa. Her: The movie called "Yesterday." Me: The movie with the woman in Africa who gets AIDS? Her: Yeah. That was sad wasn't it? Me: That's what this whole thing was about? Her: It was so sad. Her: Aren't you glad I got you to watch a foreign movie instead of another episode of Family Guy? Me: Yes, I always prefer being depressed over laughing. Her: You didn't like it? Me: Who said I didn't like it? Me: When? Yesterday? Third base. Me: Abbott and Costello. You don't know Abbott and Costello? Who's on First? Me: You know Diff'rent Strokes, but not Abbott and Costello? Her: Which one is Diff'rent Strokes? 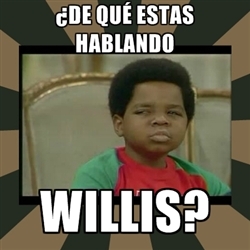 Me: Watchoo talkin' 'bout, Willis? Her: Ah, si. De que estas hablando, Willis? Me: I can't believe you don't know "Who's on First?" We'll watch it on Youtube sometime.